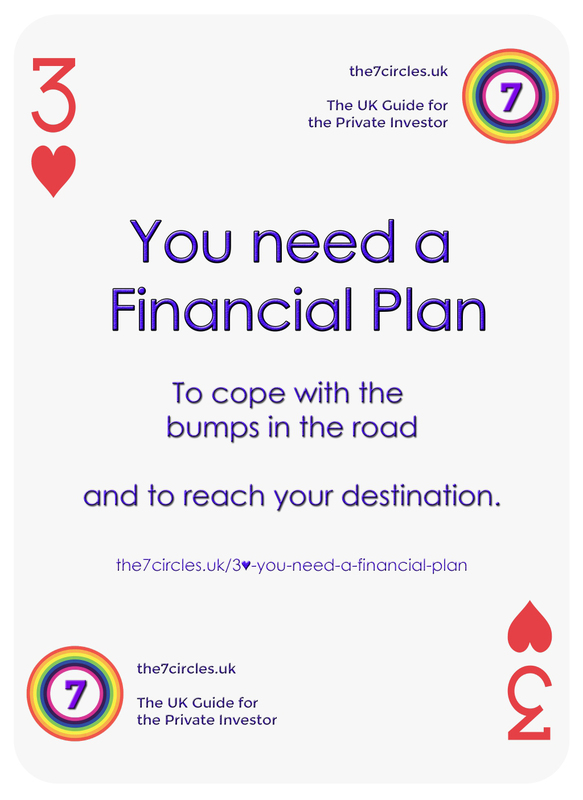 You need a Financial Plan - to cope with the bumps in the road and to reach your destination. You need a Financial Plan – to cope with the bumps in the road and to reach your destination. Ok – you know how much money you will need eventually. You’ve Done the Math. And you know that you have to get started right away. What’s the next step? I’m afraid you have to start planning. Most people don’t have a financial plan. But everybody needs one. Left to themselves, people focus on their immediate surroundings and the very near future. They also have a tendency to believe that things will always be the same and to be surprised when they change without warning. This is probably evolutionary – these things might be advantageous in a jungle full of predators. But neither trait is helpful in investing. Here, time is on your side, and you must expect constant change. Other people know what to do for the future, but they procrastinate. The solution to all three flaws is planning. Sticking to a plan brings the far-off into the immediate and what would be done tomorrow into today. We can also test out our plan against a range of future conditions. Investment planning, like all other planning, begins at the end. We have a goal, an end-state we wish to achieve, and we need to work out the simplest (cheapest, least risky) way to make it happen. Financial planning is all about where we are now and where we want to get to. The plan also includes the bit in the middle – how we get there. It balances your income and expenses to find a path to where you want to be. But your income and expenses change as you go through life. And so do your financial goals. In each of these stages your income and expenses will change. And so will your goals. Lots of people combine steps three and four as a single action, which gives us a circular four-step process: Review, Set Goals, Plan, Implement. This is an important point: building a financial plan is not a one-off event. It’s a process – something you need to engage with again and again. If you find that everything is on track, then wait a while and then do step 6 again. If your review suggests that you won’t meet your goals – or your goals have changed – then go right back to steps 1 & 2. The normal recommendation is to look at things once a year, but you might want to do it more often than that if you are just starting out. The obvious times to carry out a review are the end of the calendar year and the end of the tax year (5th April). If you haven’t done a review in the past 12 months, then the best time is right now. Ok – we know what the process is, but how do we work out where we are? The way that I recommend is to draw up a set of personal accounts, treating yourself as if you were a business. This sounds complicated, but it isn’t. You need to produce two documents – the income statement and the balance sheet. The income statement (also known as the profit & loss sheet) is your budget for the year. It describes what is happening during the next twelve months (or the last 12 months if you prefer). It includes a calculation of your current net worth. You can find examples of these documents – and more detail on how to produce them – here. An income statement is simply a list of all your sources of income, with a sub-total, and another list of all your expenses for the year, with another sub-total. Income minus expenses is how much money you have left at the end of the year, to add to your savings. This number has to be positive, or you can’t save. If it’s negative, you need to borrow money for the year, and you are going backwards. You may have debts now, but you need to be paying them down, not adding to them. Traditionally it’s divided into things that apply to the coming year (liquid assets and short-term liabilities), and things that stretch out further into the future (long-term assets and liabilities). Hopefully this is a positive number and is increasing from year to year. This is the number that shows how far you have come in achieving your goals – it’s how we measure progress. Something else that you need to consider is risk, and more particularly your attitude towards it. Someone with a high tolerance of risk will be able to consider a wider variety of options (ie. financial products) in reaching their goals than will a person who is risk averse. People often deal with risk by using insurance. Sometimes this is a good thing, and sometimes its a waste of money, but that’s a story for another day. So we have our two documents, and we know where we are. The next step is to work out where we want to get to. This involves listing your main financial goals. You may only have one, but you shouldn’t have more than say five. Financial independence – financial security – should be at the top of the list. The main financial goal in life is to build up a pot of money to provide income in retirement. Your number one target should be the ability to meet your needs from what you already have, without further income from outside. You need to represent these goals as a sum of money and a date – how much you will need and when. The simplest of these is the savings rate. This is very popular within the FIRE (financial independence, retire early) community. This approach is best suited to the young, whose circumstances can be expected to change a lot, and to those prepared to save hard in order to reach independence early. Having a number of years to aim at – a countdown – is very motivating for some people. The second approach is just to divide how much (more) you need by the number of years before you need it. If your investments grow in the mean time, you just reach your destination earlier. This approach has the advantage of simplicity. The problem is that the annual contribution is likely to be larger than you would like. Once you have this model, you can easily vary your contributions each year to suit your circumstances. This means they are less able to afford contributions, but at the same time, those contributions made at a young age are more powerful. They will compound up for longer and will have a disproportionate effect on the size of the final pot. Wages peak at age 504 so it makes some sense for contributions to rise up to that age. Whichever method you use, each sub-plan needs money. This needs to come from either your budget – your income statement – or your balance sheet. So now you need to update your financial statements to reflect your plans. If the sub-plans have too big an impact, you could end up with negative numbers on either the income statement or the balance sheet. This is telling you that as things stand, your financial goals aren’t realistic. Obviously, you can use a combination of these approaches, and most people do. But the important thing is to make things balance. Especially the income statement – you must be improving your situation each year, even after allowing for the cash you need to put aside towards your goals. So go and make yourself a Financial Plan – you’ll need one to cope with the bumps in the road and to reach your destination. Don't invest in IPOs - because you will probably lose money.